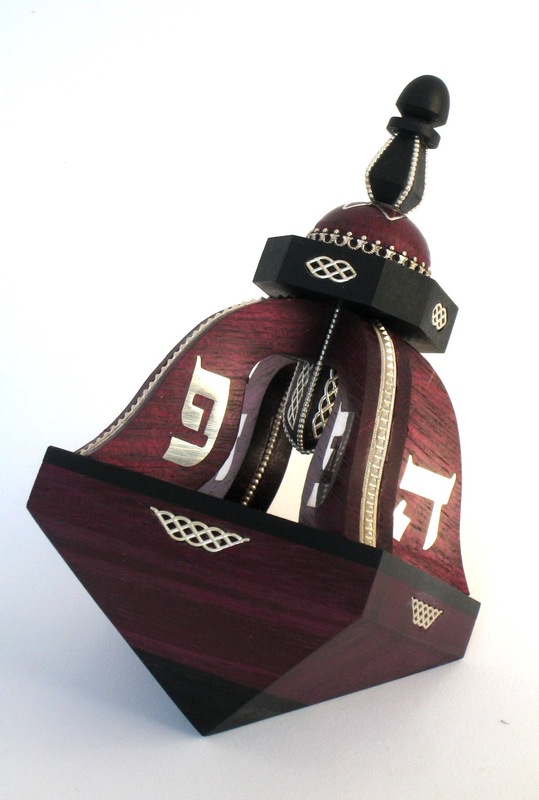 Gregory Ruvinsky is a wood artist who creates Judaica objects; he lives and works in Jerusalem, Israel. Featured here are two of his dreidels. A dreidel is a four-sided spinning top, played with during the Jewish holiday of Chanukkah. Each side of the dreidel bears a letter of the Hebrew alphabet: נ (Nun), ג (Gimel), ה (Hei),ש (Shin), which together form the acronym for (Nes Gadol Hayah Sham – "a great miracle happened there"), referring to the miracle occurring in the land of Israel at the time of the Maccabean Revolt of the 2nd century BCE. Ruvinsky has shown in numerous exhibits in Israel and the United States. Many of his works are currently on a permanent display in art galleries in Jerusalem and New York. In addition, his works are included in over 250 private collections throughout the world. Recently, four of his wood carvings were featured in a volume "500 Judaica" published by Lark Books, Sterling Publishing Co. N.Y.
Ruvinsky's artistic biography began at the age of 12, when he fell in love with carving wood and building model ships. Since that time, he has been learning and practicing woodworking, which has become his current full-time occupation. In 1974 Gregory Ruvinsky graduated from the Leningrad Hydro-meteorological Institute as an engineer-oceanologist. Subsequently, he took part in numerous marine and aerial expeditions in the former Soviet Union. Throughout his professional career he devoted much of his spare time to his craft, perfecting and expanding his artistic skills, as well as teaching children carving and marquetry. In 1991 Gregory Ruvinsky immigrated to Israel, where he has continued to work with wood, focusing on Judaica themes and motifs. On the one hand, he adhere to the Jewish tradition; on the other, he explore novel ideas and forms. All his objects are made exclusively of rare and exotic woods that he decorates with silver and mammoth tusk, using a variety of inlay and overlay techniques.